The State Parks are swimming in money! Looking and listening to nature is a complete waste of time! This must be true. If it weren’t, why would our parks convert beautiful foot trails into bicycle freeways? [NOTE] At the end of this message, you will be asked to write a letter or send an email. I implore you to do so. We take about 4 hours to cover the 4 mile distance to the MCSP parking lot. There’s so much to see, smell, hear; moving quickly defeats the purpose. Here’s a link to our last trip, where we saw, sniffed or heard at least 70 species of flowering plants and 60 species of birds. These are “single-track” trails, one person wide. When people meet, someone steps aside. People who study flowers or birds tend to stand around a lot looking at stuff, preferably on the trail so as not to stand on the plants you’re studying. Why would anyone want to spend our vanishing dollars converting such beautiful trails – perfect, as is, for hiking and nature study – into much wider bicycle trails, with graded hillside descents so bikers won’t bounce too much while they careen down the slopes? Why indeed. 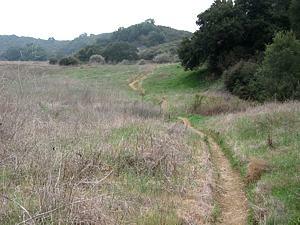 I’ve hiked Santa Monica Mountain trails for decades, both before and after the bicycles began to appear. Certain trails, like the main trail through Pt. Mugu State Park (aka Sycamore Canyon), have been ruined for hiking by the bikers. Our Audubon chapter used to bird there twice a year, in addition to our individual hikes up the canyon. Because of the bicycles, we stopped going there several years ago. It is no fun standing and watching a Flicker popping his head out of a tree-hole or a Kestrel working over some hapless vole, when suddenly a bicycle comes ripping down the trail and shoots past or even through the middle of your group. No warning bell, no horn, no shout, no “pardon me”, no nothing except the all-too-frequent rude comment. Many bikers we see now wear earphones and iPods while they tear down the trail. This is understandable: who wants to hear birds sing in the bush or hikers shout after you’ve just whacked them with your handlebars? In 2007, over 600 bikers converged on MCSP for a “Fat-Tire Festival.” There were “Poker Runs” and “wheelie contests.” This is not use, this is abuse. MCSP should not become a bicycle playground to the exclusion of all other activities. The Yearling/Lookout trail loop is one of the few places remaining where we could avoid bicycle abuse. Must every mountain trail be degraded into a bicycle freeway, filled with zooming oblivioids barely aware they’re riding through fields and forests rather than brickyards? I don’t think so. When is enough, enough? Hikers and birders should not need to risk life and limb to enable bikers to reach every conceivable destination from every possible starting point in the shortest possible time. Apparently CORBA (Concerned Off-Road Bicyclists Association) won’t be happy until they get exactly that: every trail a bike trail. According to them, converting the Yearling and Lookout Trails will set a “precedent that would open even more trails to bicyclists, much of it single track, in the Santa Monica Mountains National Recreation Area.” That’s right, they really, really want to use the trails where hikers will have to leap out of their way. Their website also – fallaciously – states: “More trails open to bicycles means reduced congestion on other trials and an improved trail experience for all users.” If “all users” includes anyone not on a bike, forget about it. In a March 23 Malibu Times article Superintendent Craig Sap is quoted as saying: “the creation of step-off areas or “passing” lanes could accommodate both [horses & cyclists] since the trails are naturally very narrow, where blind spots are common.” I suppose that the cyclists will conveniently come speeding at you only when you happen to be next to such a “step-off” zone. The entire Sycamore Canyon trail is wide enough to accommodate park rangers’ vehicles, yet hiking is still unsafe. Thank you for your letter to Supt. Sap expressing opposition to the trail conversion. I use “Reagan Ranch State Park” as a useful way to maintain the historicity of the parcel which, in my understanding, was its own entity before being absorbed into Malibu Creek State Park. Many, perhaps most, local people still call it Reagan Ranch. It certainly has its own identity, different from the rest of the park. Poison Ivy: In describing my encounter with Poison Oak in the April 9 hike blog, I mentioned Poison Ivy, Poison Sumac and Mango. These last three plants do not grow in the park, it was not stated nor implied that they do, and I am surprised that anyone might think I was saying they did. Especially the mango, the fruit of a tropical tree. What they share with Poison Oak is a toxin to which most – but not all – people have an allergic response. Map: I don’t think it matters where it’s from. It was a good map. Whacking hikers with handlebars: I have seen it occur, and the biker did not crash. It may cause them to crash, but not necessarily. It depends on the situation. You will drastically improve the effectiveness of your comment if you put some thought into it, instead of just a knee-jerk response. First, there is no “Reagan Ranch State Park” in the State system, and Superintendent Sap knows this. He also knows poison ivy doesn’t grow in California. I’ll bet he even knows the map you used at the top of this page is from a mountain biker’s website. If he rides a bike, he probably knows that whacking a hiker with a handlebar will instantly cause the cyclist to crash. Between the ignorance and drama on this page, and the outright theft of Karl Knapp’s name on another web page opposed to the trail conversion, the no-bikes crowd has lost credibility. For every hiker who complains about speeding cyclists, there is a hiker/biker/equestrian complaining about selfish hikers parking in the middle of the trail instead of moving off the trail so other trail users can pass – what, you think there WON’T be other trail users sharing “your” trail? If you’ve seen rude or hazardous cyclists, and object to sharing a trail with them, just say so. If you only like slow-moving trail users, just say so. If you can think of an objective reason (habitat, trail damage, short sight lines, no room for passing) that different user groups should not be on the same trail, just say so. Park managers will laugh at – and dismiss – exaggerated CLAIMS. They might give a nod to ARGUMENTS, but they will always listen to actual REASONS. Give them REASONS to deny the trail conversion, not drama or conspiracies or empty whining. I’ve been a mountain biker for three decades, but I oppose the conversion and I sent Supt. Sap my reasons. Give him more REASONS, or the same REASONS from a lot more people, and you may get what you want. Recently I joined a group of hikers walking in the Reagan Ranch meadows in MCState Park along the Yearling and Lookout Trails and learned that a group called CORBA (Concerned Off-Road Bicyclists Association) is intent on having these trails rerouted and widened. I am opposed to this alteration to accommodate the bikers. It seems the off-road people already have several routes from several directions open to their bicycles to get into Malibu Creek State Park. Why deprive hikers from enjoying some solitude in their walk on the one remaining no-bicycles-allowed path into the Park? There is more behind CORBA’s request than just opening one more trail to riders. I also learned that CORBA apparently wants ALL other trails in the Santa Monica Mountains, and possibly beyond, modified for bicyclists. Knowing that state parks are very short of money, the Association supports, or will support, Parks and Recreation with funds to construct the new trail (and perhaps other trails as well). They even will agree to maintain the trails; although I’m told their record here is questionable. This inducement is nothing short of a bribe, and is especially egregious when they themselves are at least partially funded by the off-road bicycle industry. This industry, to increase sales, is behind the movement to eventually open all trails in our state parks and forests to off-road bicycles. CORBA, besides supporting cyclists, acts as a front group for the industry, which sees the Yearling and Lookout Trails use permit as a way to further their ambitions. It is a very clever way of letting someone else do the work and receive the credit, while you remain in the background making the money. I hope you are aware of the shenanigans going on as you make your decision in this matter. Please consider that the concept of “multiple use” is not viable for all situations. I use a road bike myself and am not opposed to the considered use of mountain trails for off-road biking, but there are limits to where such biking is appropriate. Please acknowledge those limits. I’m writing this letter to protest the conversion of the Yearling and Lookout trails in Reagan Ranch and Malibu Creek State Parks. In fact, I protest the conversion of any more hiking trails anywhere in our State Park system to bicycle trails. It is not a favorable commentary. I’ve also alerted the local birding community about these plans. I am a 20-year member of the Santa Monica Bay Audubon Society, and their Field Trip Chairperson for about 10 years. I’ve hiked in the Santa Monica Mountains for almost 40 years. In my experience, hikers sharing trails with bikers is no more safe for hikers than is bikers sharing roads with cars safe for bikers, and for exactly the same reasons. In both cases, the operator of the heaver, faster moving vehicle is overly aggressive, resentful of having to share the road (or trail) and heedless to the point of endangerment of the lighter, slower-moving person. Both are often distracted by their radio (or iPod/earphones). One difference: cars have horns and the drivers use them to warn. In well over 10 years of sharing trails with bicycles and being passed by thousands of them, I have seen only one person with a warning device, in that case a bell. The overwhelming majority of bikers have no bell or horn. About 5% of them will shout a warning. The other 95% of bikers simply blow on by. Lest you think I simply hate bikes, I sold and repaired bikes for a living in West Hollywood, back in the 1970’s. I did my best to convince every customer to purchase a horn or bell, for their own safety as well as for others. I was nearly always successful. I rode a bicycle to work for many years, and for recreation on weekends. I know about cars and bikes, and pedestrians and bikes. I love bikes. I also know how to ride safely and considerately, something for which the vast majority of mountain bikers apparently have no use. 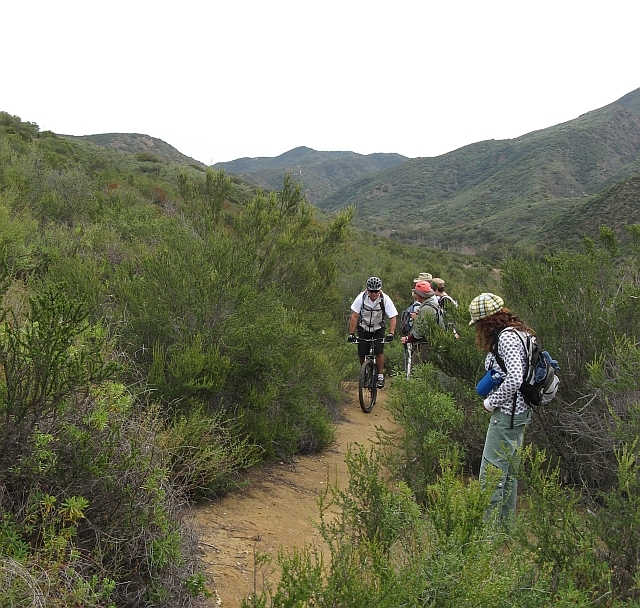 In Sycamore Canyon in Point Mugu State Park (southwestern Ventura County), I have seen people hit by cyclists or leap off the trail into ditches, brush or poison ivy. Too often I’ve heard bikers shout after they plow alongside or through the middle of our birding group, “Hey, get outta the way, you $#@%$!” Everything that bikers complain about car drivers doing to them, they themselves do to hikers. Our Audubon Chapter held field trips in Sycamore Canyon twice a year for about 20 years. We gave up a few years back due to the recklessness of the bikers. You are doing an immense disservice to all non-biker users of the State Parks in general, and Malibu Creek – Reagan Ranch SP’s in particular by altering their current “single-track” pedestrian-only status to permit bikes. (Horses, by the way, are no problem.) Considering the current status of funding for the State Parks, and the number which have been closed to the public, I’m astounded to think that we actually have money to spend on degrading our trail system. Please do not convert these trails to use for bicycles. Bikers have, and have sufficiently ruined for non-bikers, enough trails already. I’m not crazy about templates, per se. When people copy them and send them, the recipient gets a bunch of identical messages, which significantly dilutes their impact. It certainly would dilute it for me, were I getting them. However, you can copy the blog above for a template, past it into an email, and change or delete everything that doesn’t work for you. The basic facts are there. PS: Sorry the map lettering is so small. If you double click it, the map enlarges. Same for the pictures. I believe I am the most frequent bike rider in this group. In the mountains, however, I am a walker and a hiker. I’ve written my comment against expansion of bike trails. Have you? It doesn’t take much effort. why don’t you write a letter template and we can all adapt it and send it/email it?